At the Centeno-Schultz Clinic we acknowledge that shoulder pain can compromise quality of life and athletic endeavors. Our online book, Ortho 2.0 highlights a systemic evaluation of joint pain and dysfunction. The approach is termed SANS. The N is SANS denotes nerve dysfunction. 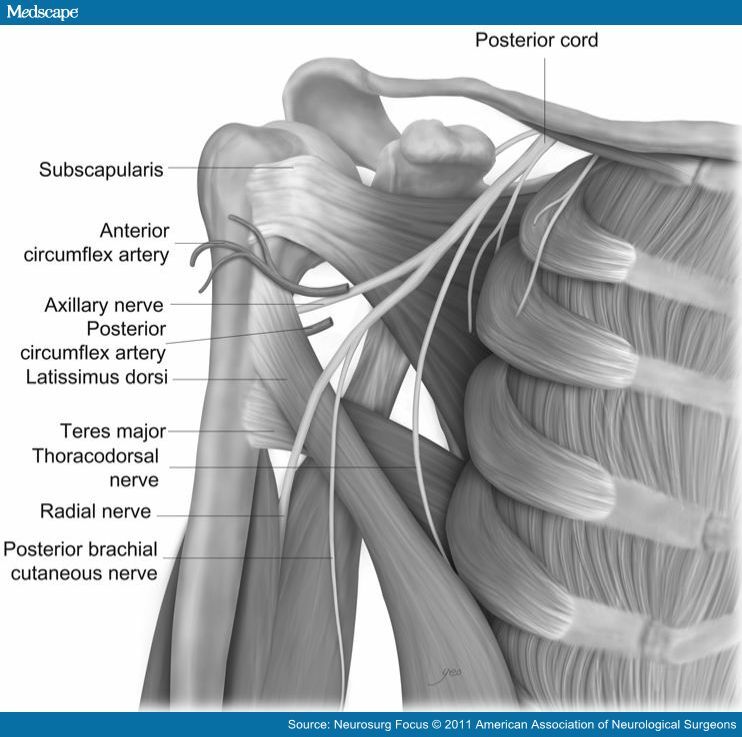 Axillary nerve dysfunction can be a cause of lateral arm numbness and shoulder weakness. The Axillary nerve arises from the posterior cord of the brachial plexus, C5 and C6. 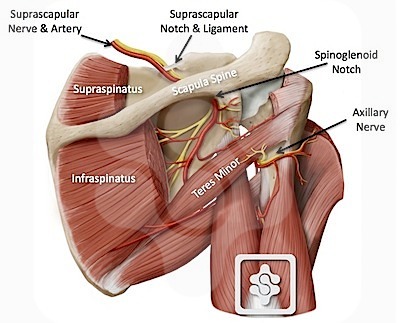 Course: It crosses the antero-inferior aspect of the subscapularis muscle, passes behind the arm through the quadrilateral space, winding around the neck of the humerus ending in two major trunks: anterior and posterior trunk. Sensory: Lateral deltoid also known as the regimental badge area. 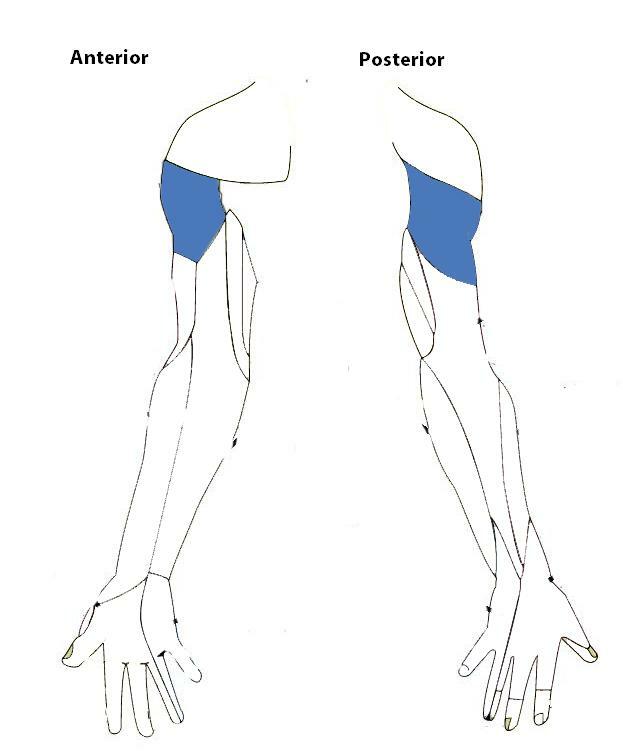 The quadrilateral space is bounded superiorly by the teres minor muscle, inferiorly by the teres major muscle, medially by the long head of the triceps, and laterally by the humeral shaft. Common presentation is dull intermittent ache or pain that is localized in the posterior and lateral shoulder. Symptoms are exacerbated by active and resisted abduction and external rotation of the humerus. Quadrilateral space syndrome is an affliction of middle-aged men and it presents classically in the throwing athlete and those with a history rotator cuff surgery. 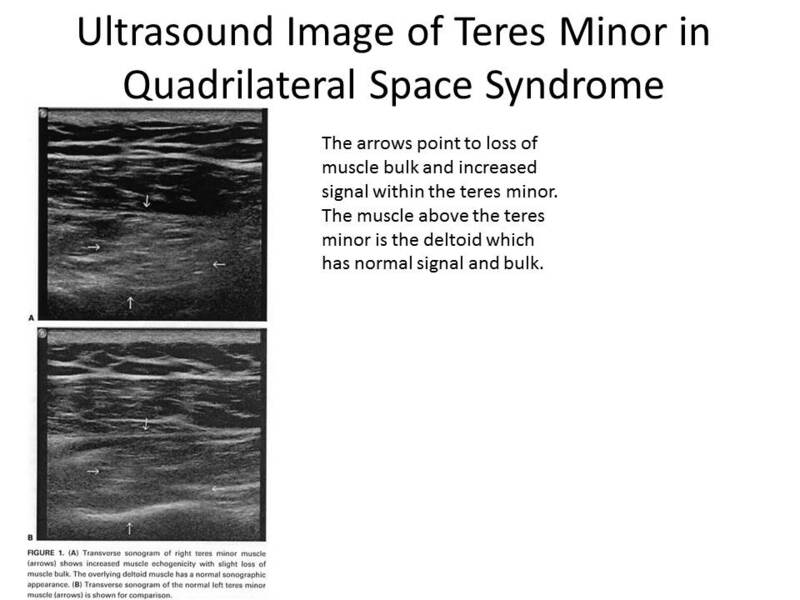 Ultrasound examination is can be significant for atrophy of the teres minor muscle which is illustrated below. The Centeno-Schultz Clinic is a research based medical practice that acknowledges the importance of research. Our publications to date are multiple and easily identified in the U.S. Library of Medicine. Stem cell therapy is a successful alternative to traditional surgery in the treatment of ACL tears. Successful cases of ACL repairs have been discussed in prior blogs with comparisons of pre and post MRI’s illustrating the healing afforded by autologous stem cell treatment. Regenexx currently has an ACL stem cell study which is available for patients that qualify and can travel to our Broomfield clinic. Positive diagnostic MR imaging of the affected knee with at least 1/3 of the ACL ligament at any area along its length having high signal on MRI PDFS/Fat Sat images. 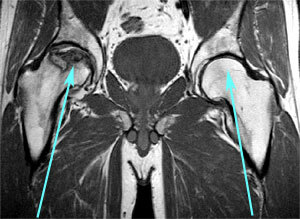 A massive ACL tear or one that includes more than 2/3’rds of the ligament that’s retracted. Concomitant meniscus tear or cartilage injury that occurred at the same time as the as the ACL tear and which is considered a pain generator. If you or family or friends are interested please contact us at 303 963-9528 or complete the Regenexx candidacy form. Regenexx ACL procedure is dynamic new technology that enables a patient to use their own stem cells to heal ACL tears. This procedure was featured in Outside Magazine. Extreme skier and founder of DPS Ski, Stephan Drake, tore his ACL while skiing a steep face in Alaska. He rejected surgical repair and opted for Regenexx ACL at the Centeno-Schultz Clinic in Colorado. Regenexx ACL is a alternative to traditional knee surgery. 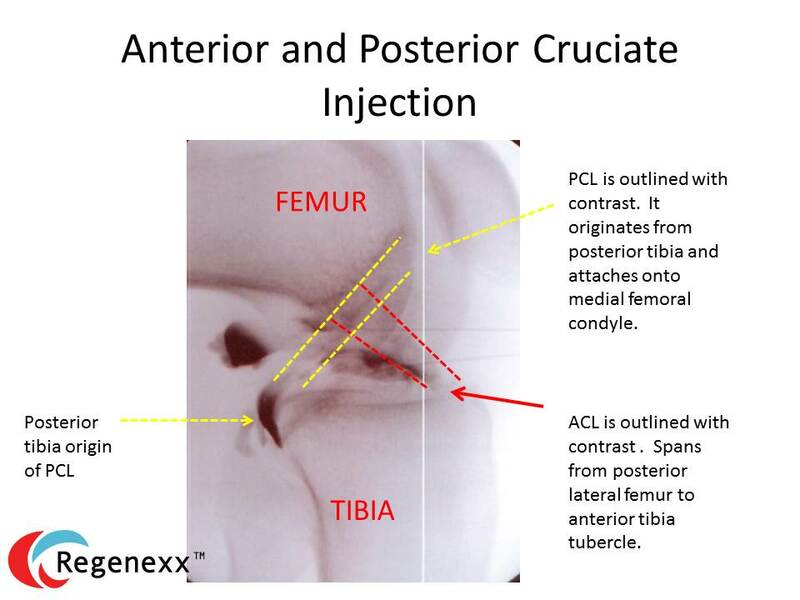 Bone marrow derived stem cells are injected under direct visualization into the ACL. Patients are fitted with knee brace and undergo 4 weeks of physical therapy. Complications of ACL surgeries have been discussed previously and include graft failure, infection and acceleration of arthritis. Successful clinical cases with detailed pre and post treatment MRI’s outlining improvement have been presented in previous blogs. 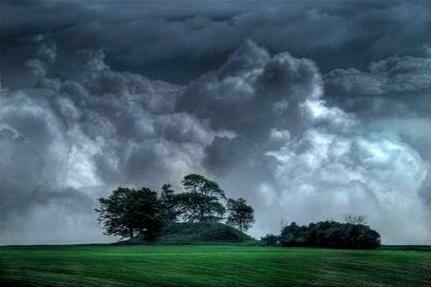 It is a new day in orthopedic medicine with new opportunities. Not long ago open heart surgery with bypass and coronary grafting was the standard of practice. Then interventional cardiology with a new skill set including balloon angioplasty became the new standard of care making coronary bypass surgery a less prevalent and less attractive procedure. The Centeno-Schultz Clinic utilizes a special advanced platelet rich plasma (PRP). The injection of platelet rich plasma is a successful treatment option for joint, tendon, ligament, muscle and joint injuries. The concentrated blood platelets contains critical growth factors that increase the body’s ability to repair itself. In most clinics and hospitals and clinics, PRP is created by a bedside centrifuge that separates the plasma and concentrates the platelets. 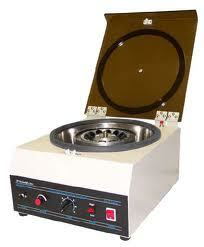 Bedside centrifuges typically create a PRP with platelet counts of 3-5 times the normal. 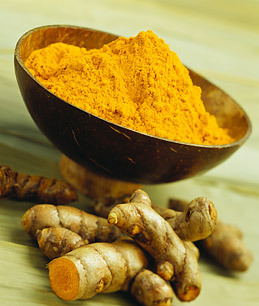 Unfortunately they also contain white and red blood cells which can cause inflammation. Are there differences in PRP treatments? Regenexx has a superior PRP called Regenexx SCP (Super Concentrated Platelets). It is created by cell biologists in a state of the art laboratory and results in a 10-20 fold concentration of platelets. Higher concentration of platelets has been shown to have a positive effect on the stem cells responsible for repairing damaged tissue. White and red blood cells within platelet rich plasma can result in excessive inflammation, pain, restriction in range of motion and inhibition of repair cells. Bedside centrifuges are not adept at removing white and red blood cells whereas cell biologists at Regenexx are very capable of separating these cells. The image below demonstrates the cardinal difference. The PRP on the left is red in color due to the red blood cells whereas the Regenexx SCP on the right is amber in color due to the successful removal of most red and white blood cells. PRP is an effective treatment of many ligament, tendon, joint and muscle injuries. There are differences in platelet rich plasma concentrates. Regenexx SCP which is produced in a state of the art lab by a cell biologists affords a much higher level of platelets with reduced red and white blood cell contaminates which ultimately results in best possible outcomes. At the Centeno-Schultz Clinic we acknowledge the negative impact of NSAID on repair. 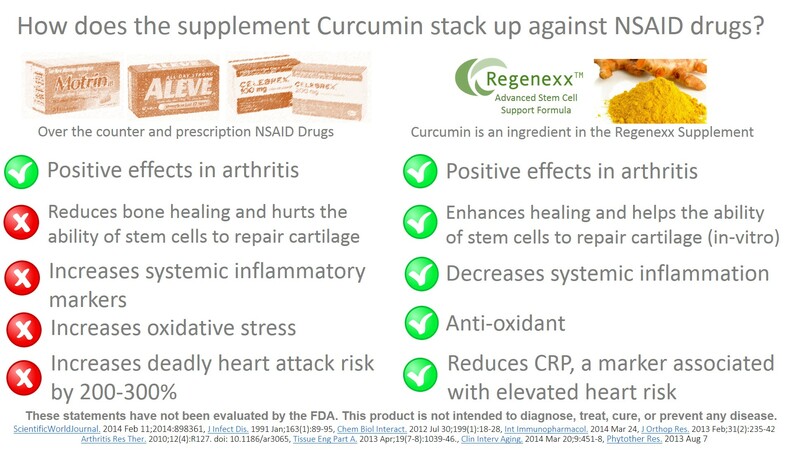 NSAID have been reported to affect bone metabolism, fracture healing and increase the risk of sudden death heart attack. Unfortunately NSAID medications continue to be prescribed for musculoskeletal pain including pain subsequent to surgical rotator cuff repair. Does this medication make a difference in healing? Checkik in a recent article examined the impact of NSAID on rotator cuff healing after surgical repair. 39 rates underwent rotator cuff injury and surgical repair. Group A received meloxicam for the first 10 days whereas Group B recived meloxicam from postoperative day eleven. Group C received saline injections. Results: Group B displayed lower maximal load which is consistent with delayed healing. Bottom Line: Avoid NSAID as they delay healing. At the Centeno-Schultz Clinic we acknowledge the pain and restriction in motion associated with groin pain. 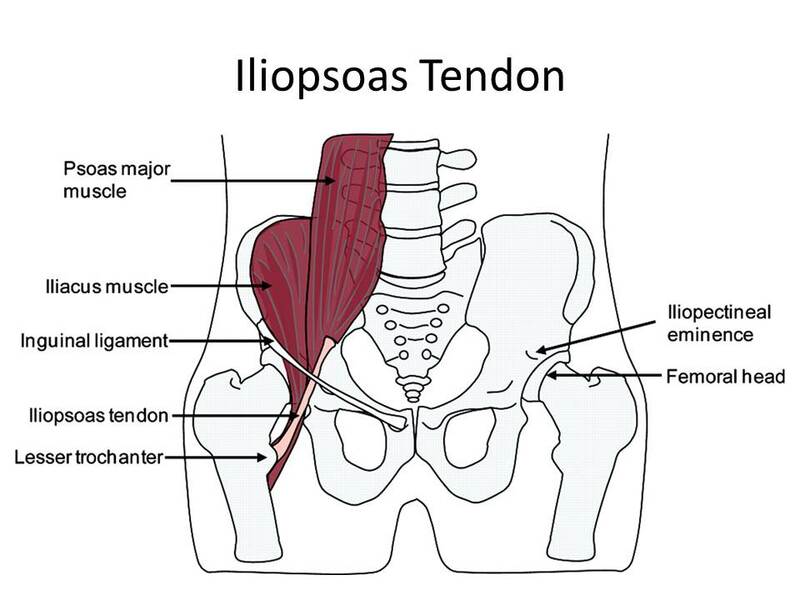 Inflammation of the iliopsoas tendon can be a cause of groin and anterior hip pain. Treatment options include prolotherapy and platelet rich plasma injections. The psoas and iliacus muscle originate from the lumbar spine, converges to form the iliopsoas muscle and its tendon attaches onto the lesser trochanter of the femur. The musculotendinous junction can be found in a groove between the anterior inferior iliac spine and the iliopenctineal eminence. 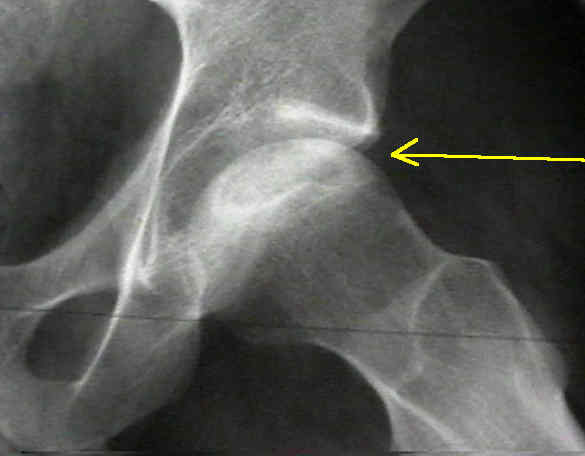 Major causes of iliopsoas tendinitis are trauma and overuse resulting from repetitive hip flexion. In adolescents the combination of inflexible hip flexors and tightness of the iliopsoas muscle and tendon can lead to anterior pelvic tilt and increased stress on the lower lumbar discs and facets. 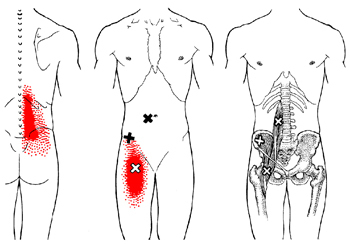 Groin or anterior thigh pain is a common presentation as illustrated below in red. Physical examination may be significant for anterior pelvic tilt, tenderness of the iliopsoas tendon and a snapping hip sign. At the Centeno-Schultz Clinic a diagnostic ultrasound is utilized to confirm the diagnosis. 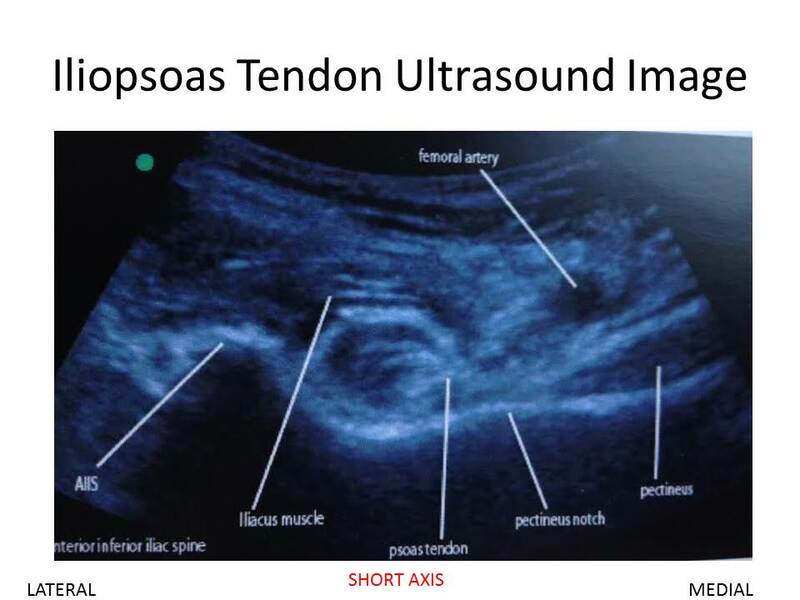 Below is an ultrasound image identifying the iliopsoas tendon and adjacent femoral artery. Effect of Amide Local Anesthetics on Stem Cell Viability: Patient BEWARE ! At the Centeno-Schultz Clinic ongoing research and publication is a cornerstone of the practice. Multiple articles have been published in peer-reviewed journals. A new article just published examined the effect of amide type local anesthetics on human mesenchymal stem cell viability and adhesion. Local anesthetic are commonly utilized in joint and injections. Local anesthetics combined with high dose steroids are commonly injected into the joint. The local anesthetic provides numbing which gives the patient several hours of pain relief. Do the injected local anesthetics affect stem cells? Four amide local anesthetics were examined in varying concentrations: ropivacaine, lidocaine, bupivacaine and mepivacine. Each anesthetic in different concentrations was incubated with human mesenchymal stem cells for 40 minutes, 120 minutes and 360 minutes and 24 hours. Cell viability was assessed at each time point. Extended treatment with local anesthetics for 24 hours or more had signficant impact on both stem cell viability and adhesion. Stem cells treated with lidocaine, bupivacaine and mepivacine resulted in cell death via apopotosis after brief exposures. Amide local anesthetics induce stem cells apoptosis(cell death) in a time and dose dependent manner. 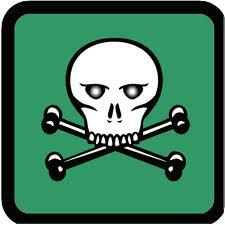 Patient beware! 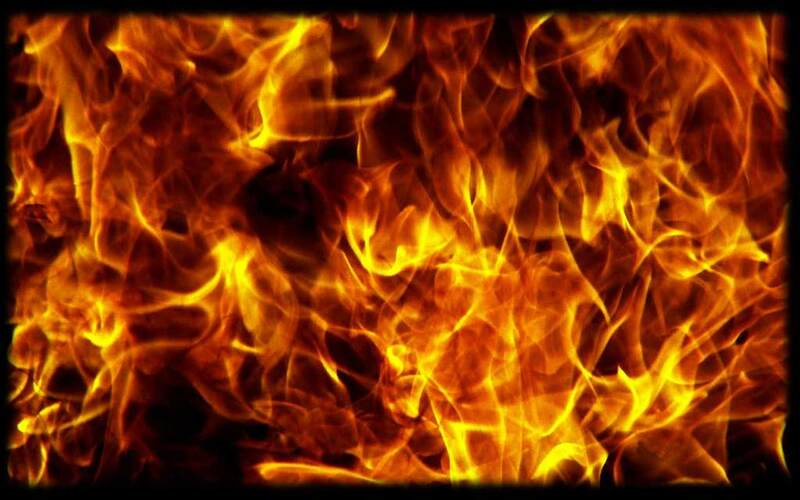 Know that injected local anesthetics can negatively impact your repair cells. If you medical provider wants to inject your joint ask why and with what acknowledging that your repair cells and cartilage are at risk of damage.